(CNN) - Newt Gingrich said Tuesday he wouldn't vote for Ron Paul if the Texas congressman won the 2012 GOP nomination. Speaking to CNN's Wolf Blitzer, Gingrich slammed Paul as out of line with mainstream Republican viewpoints, including his stance on Israel, Iran, and September 11. "I think Ron Paul's views are totally outside the mainstream of virtually every decent American," Gingrich said on CNN's "The Situation Room with Wolf Blitzer." Gingrich continued: "He's got to come up with some very straight answers to get somebody to take him seriously. Would I be willing to listen to him? Sure. I think the choice of Ron Paul or Barack Obama would be a very bad choice for America." When asked if he would be able to vote for Paul if his rival won the 2012 GOP nomination, Gingrich said unequivocally "No." "I think it's very difficult to see how you would engage in dealing with Ron Paul as a nominee," Gingrich said. "Given the newsletters, which he has not yet disowned. He would have to go a long way to explain himself and I think it would be very difficult to see today, Ron Paul as the Republican nominee." Paul's role in writing newsletters with racist remarks came under increased scrutiny last week as polls showed the Texas rising in popularity among Iowa voters. The most recent, from the American Research Group, shows Paul, Gingrich and former Massachusetts Gov. Mitt Romney in a dead heat for first place. Paul has indicated he did not write all of the content in his newsletters and had not read some of it before publication. In responding to negative ads Paul's campaign has released slamming Gingrich's record as a conservative, the former House speaker said the spots were inaccurate. "You look at Ron Paul's record of systemic avoidance of reality, his ads are about as accurate as his newsletter," Gingrich said. 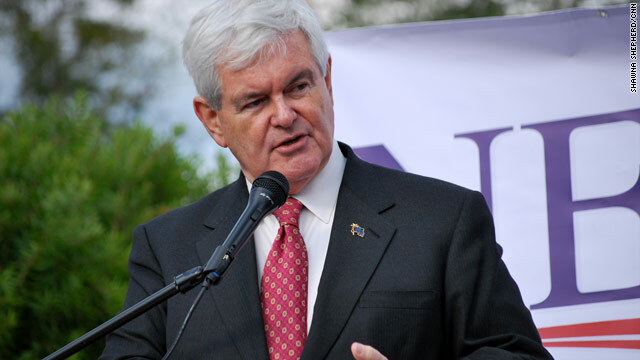 Gingrich named Paul's stance on Iran as representative of Paul's extremist viewpoints. "He's not going to get the nomination. It won't happen," Gingrich said. "The people in the United States are not going to accept somebody who thinks it's irrelevant if Iran gets a nuclear weapon." Paul's campaign responded to Gingrich Tuesday, calling his remarks "childish." "Frustration from his floundering campaign has Newt Gingrich showing who he really is: a divisive, big-government liberal," Paul Campaign Chairman Jesse Benton said. "Newt has a long record of standing against conservatives dating back to his support for liberal Nelson Rockefeller over Barry Goldwater, so this sort of childish outburst is nothing new." Newt certainly has nothing to be proud of so he should stop bad mouthing everyone! Newt being a MASTER of "bad choices". Well! Newt Gingrich is certainly the person I'd listen to for any idea as to who was the right person for the job! In other news, Lucifer criticizes Jesus for being a socialist. "He just heals them for free – what kind of message does that send?! He's a Commie if you ask me! If they want to be healed they should PAY for it! Why should we just help a bunch of poor losers?" Ron Paul has the presidency practically in his hands right now. The Media and GOP are throwing everything including the kitchen sink at Paul. ITS TOO LATE TO STOP RON PAUL, ITS TOO LATE. That's ok, Newt. We can't vote for you, either. Hahah this comes from the man that wanted the death penalty for simple cannabis possession, i sense a little bit of jealousy from newt maybe hes just mad because things are not going his way nothing better then trying to discredit the other runners. "I think Ron Paul's views are totally outside the mainstream of virtually every decent American," says the man who has cheated on wife one for wife two, then cheated on wife two for wife three . . . . In a battle for the prize of lesser of evils, racist Paul wins this contest. Grinch's support of Israel makes him a traitor to the US. He puts their safety & security above our own.